First I must say that the word grey trips me up. Why are there two spellings? I always use grey and I have no idea why. Does Crayola use grey instead of gray? Is that where it got into my head? 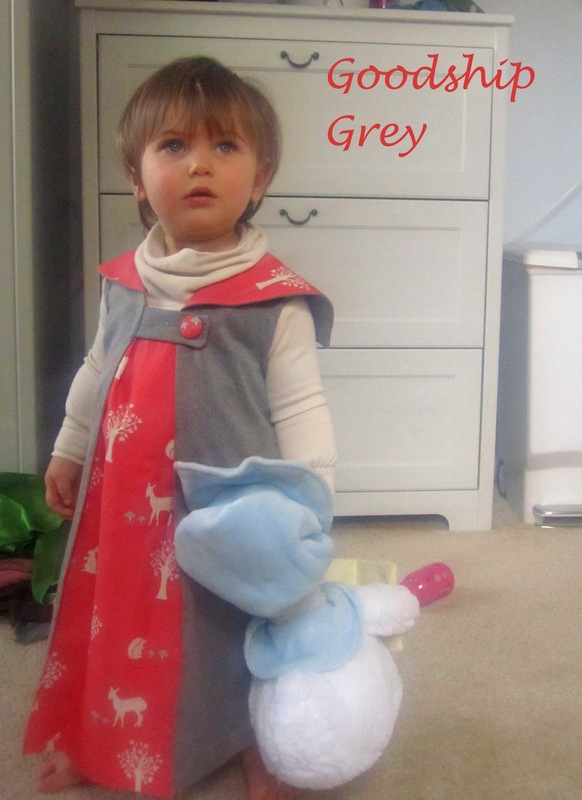 Anyway, I am slightly obsessed with grey lately, however you spell it. Grey with other pops of color is my go-to spring look this year. I’ve already shown you the Scallops By The Sea dress (are you sick of it yet? 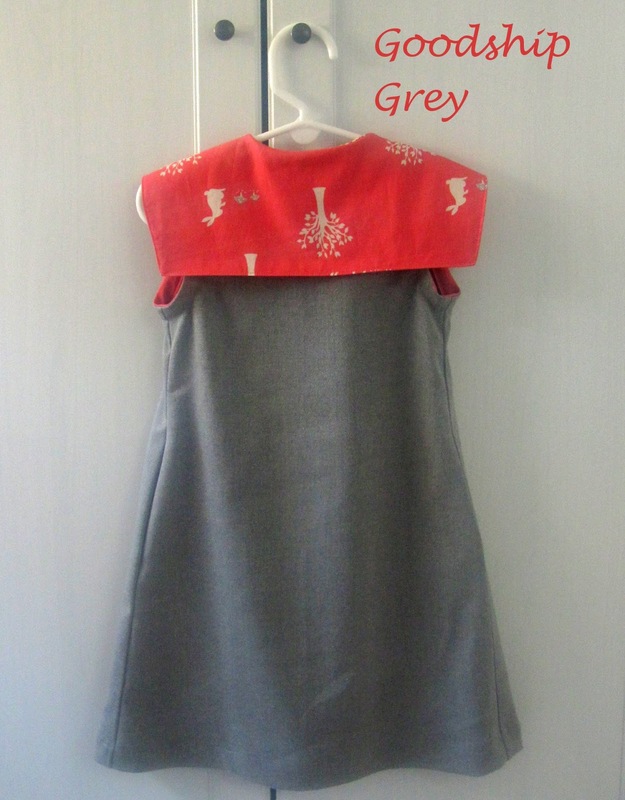 hehe), but I made two more clothing items with the same amazingly soft grey polyester this week. One I can’t tell you about yet (super secret pattern testing hehe), but here is the other. A Goodship dress by Karen LePage. I made a size 2T which Bean is almost fitting in to. Pants she’s definitely 2T with her long legs and cloth diapers, but her chest and waist are more 18m still. 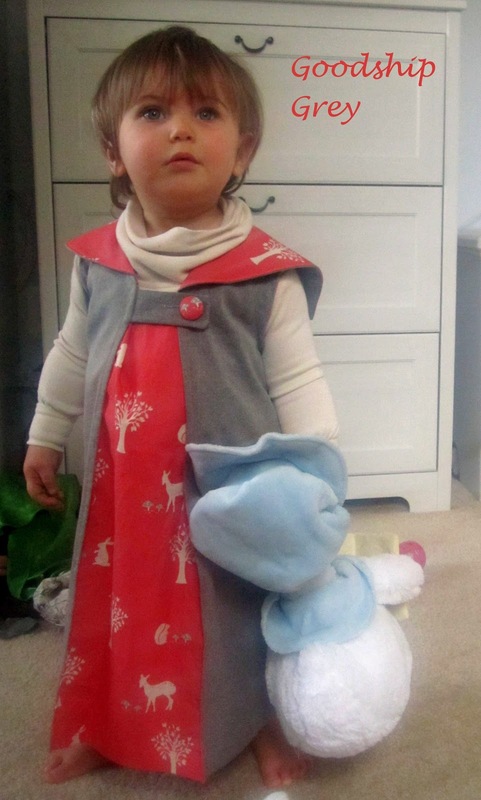 So with this dress the length is way too long for her, but the top fits great with just a little room – perfect for a turtle neck underneath for this colder season. It’ll get lots of use this summer I think. The coral fabric is from Jay-Cyn Designs Storyboek called Field Friends Coral. I love it. There are little squirrels, deer, and bunnies mixed with some trees and mushrooms. The color is lovely with the grey too. 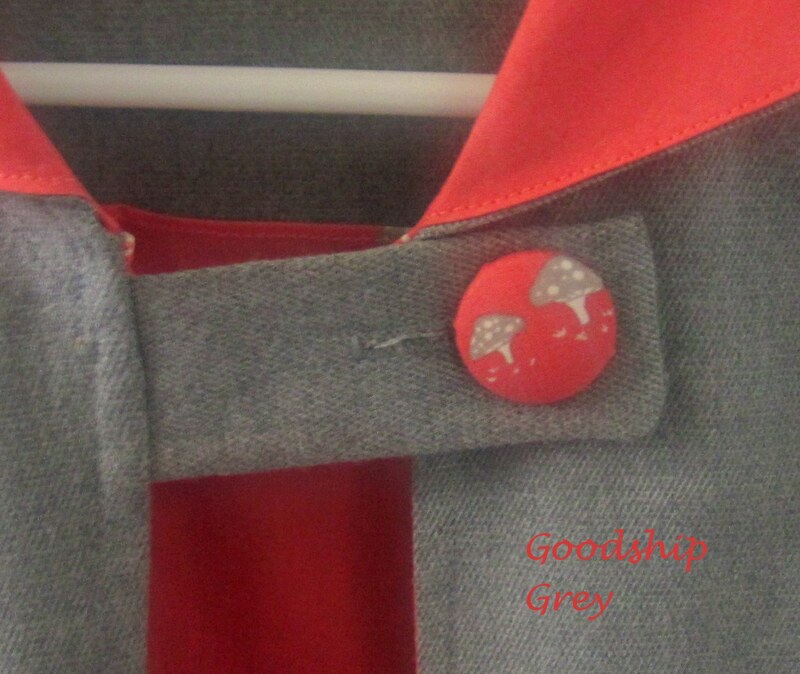 I used a bit of the mushroom to make a button for the front. I decided on the button tab closure instead of the sashing since I think it plays the dress down a little bit. I wanted a more casual look and that tab is great. Above you can see the length is a little crazy right now, but she’ll grow into it quickly. I made the cowl neck shirt earlier this fall when I was doing mock ups for my Peggy’s Purple Dress. I made two turtle necks (the other you can see in the peggy post) and one dress before I finally made the purple one and I love the way they all fit Bean. They have been amazing staples this fall/winter. I’ll have to design another layering shirt for this early spring since soon (hopefully) a cowl or turtle neck will be a little too much. As a side note to all you amazing photo takers out there. Why are my pics coming out so grainy all the time lately? The lighting is TERRIBLE in the house, but Bean’s room has the best so I try to take all the pictures in there. No matter what I seem to be getting it wrong lately. Is it cause she’s moving too much? I’m hoping once the weather turns and I can take pictures outside things will get back to decent around here in the photo department, but I’ll take any tips I can get! T’onna from Navy Wifey Peters featured this! I'm liking the button tab closure!! Very sweet….and we are suckers for GREY/GRAY too. PoTAto, PoTAHto, ToMAto, ToMAHto…right?? I spell grey that way too and my students always tell me I spell it wrong. Like they know anything about spelling. CUTE! Love those colors. One of my favorite combos. I always pause when I'm spelling that too. I love the color combo! The button is adorable too. I'm the same with you with the pictures. I can't wait for summer so we can go outside for photos! Did you get tips on your lighting? Are you using a DSLR? The "grainy" is usually from using a high ISO but you have to when you're inside. I usually adjust my white balance inside – you can play around to see what looks best with your camera. Basically, I have to make my white balance a little "cooler" with inside lighting. This dress is cute! I like the flap thingy on the back. It reminds me of the navy's dress uniform. 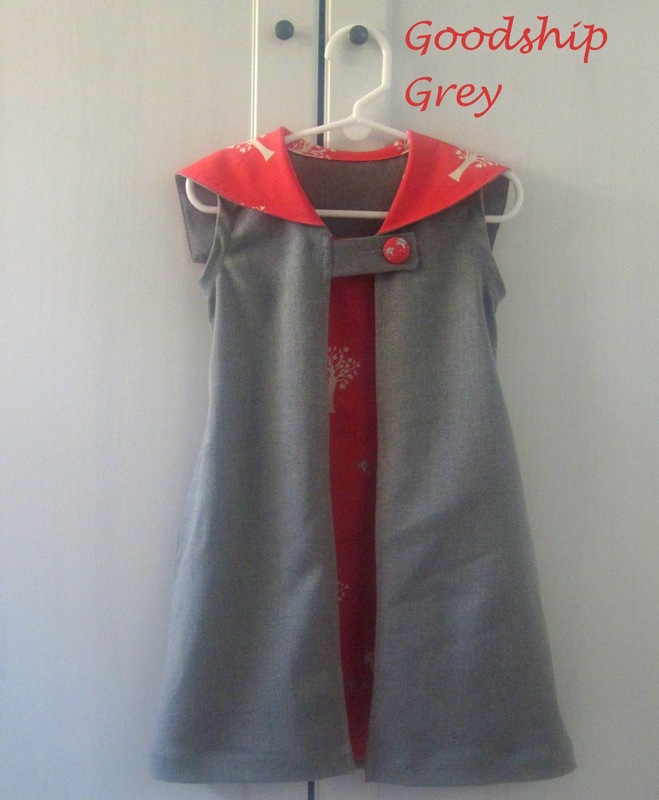 Anyhoo, I love gray! I spell it with an A, and I've always wondered why there are 2 spellings… Thanks for sharing at Submarine Sunday! 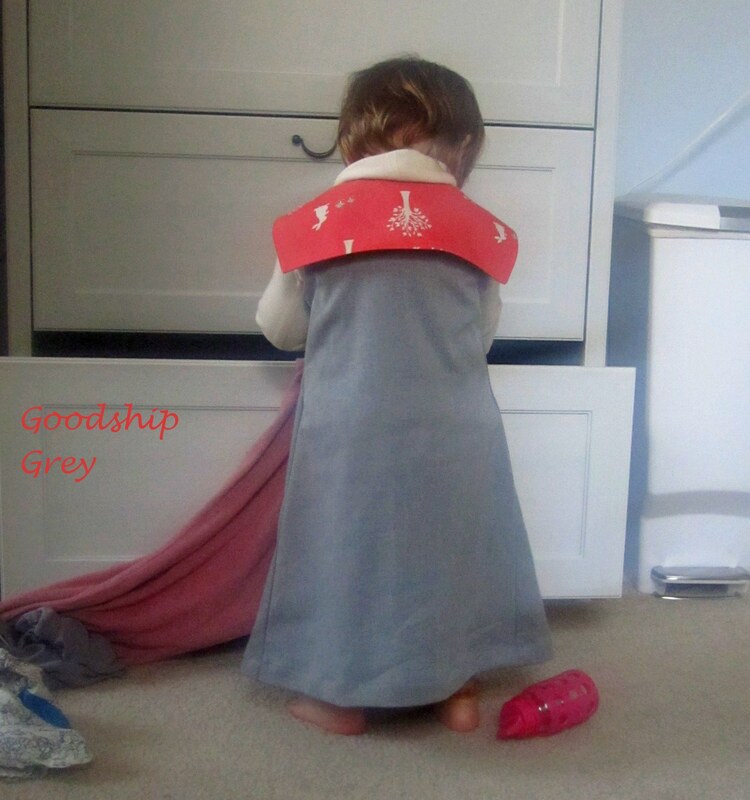 If I see a Goodship dress, I click it! This is fab! I'm terrible at photos so I feel your pain. Idon't have a lot of natural light in my house, so I try to take pics outside when weather permits and that helps. I wonder if we are both working on the same super secret pattern testing?!! I'm dying to show mine too!